(Grand Prairie, Texas - Friday, October 7, 2016) - On Wednesday, October 12 at 1:00 p.m., a memorial service will be held for trainer and jockey Clifton De Tiege in the Retama Park Chapel. 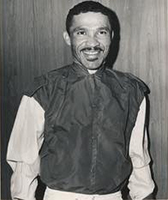 Among other accomplishments, De Tiege was the winning jockey in the 1962 All American Futurity. Clifton Tom De Tiege, 75, of Brady, passed away Sunday, July 3, 2016 in San Antonio. He was born in Dayton, a son of Paul and Magnolia (Vargas) De Tiege. He was a horse trainer and horse jockey, riding in many races all over the United States. He won the All American Futurity in 1962 on Hustling Man. Known as the “Rajun Cajun,” he adored animals, especially his cat, Little Bit. He was preceded in death by his parents; two sisters, Beatrice and Edna; and two brothers, John and Sydney. Survivors are his wife of 52 years, Ella Mae (Jackson) De Tiege; two children, Clifford Joseph De Tiege and his special friend Debbie of San Antonio and Alicea De Tiege-Campos and husband Martin of San Antonio; three brothers, Earnest De Tiege, Roy De Tiege and Joseph “Shorty” De Tiege, all of Dayton; three sisters, Geneva Briggs and Mary Jones, both of Dayton, and Juanita Williams of Baytown; brother-in-law, Rodis Briggs of Dayton; three grandchildren, Clifton De Tiege, LaDeidra De Tiege and Valencia De Tiege; four great-grandchildren; and numerous nieces and nephews.